The English Reformation isn’t as popular as the German, Swiss, or even the Scottish Reformations. There you have singularly interesting figures like Luther, Calvin, and Knox. In England you have characters like Henry VIII and Bloody Mary, but you also have Cranmer, Ridley, and Latimer and others who lost their lives in the reformation process. 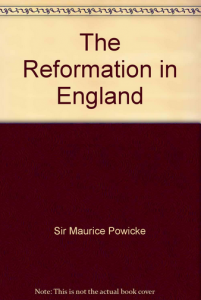 The English Reformation begins on the precarious note of the Catholic Henry VIII wanting to divorce his wife but not being able to because of Catholic law, and ending with a more Protestant Henry, not only divorcing Catherine, but becoming the religious head of his country’s new church, the Church of England. All of this took place in the background of Henry dissolving the Catholic monasteries and dividing up the proceeds within England. Most interesting, however, was the struggle between church and state. Does the church stand on its own right as the Roman church claims, or does its existence derive from the power of a free country and the will of the governed? England, of course, couldn’t go the whole way as its prodigal son, America, did and completely separate the two. It was too tied to its Bishops and Parliament to throw either overboard. It would pay for its timidity over and over in the years ahead as its people were persecuted by a state church and as it famously, but only once, executed its own king.